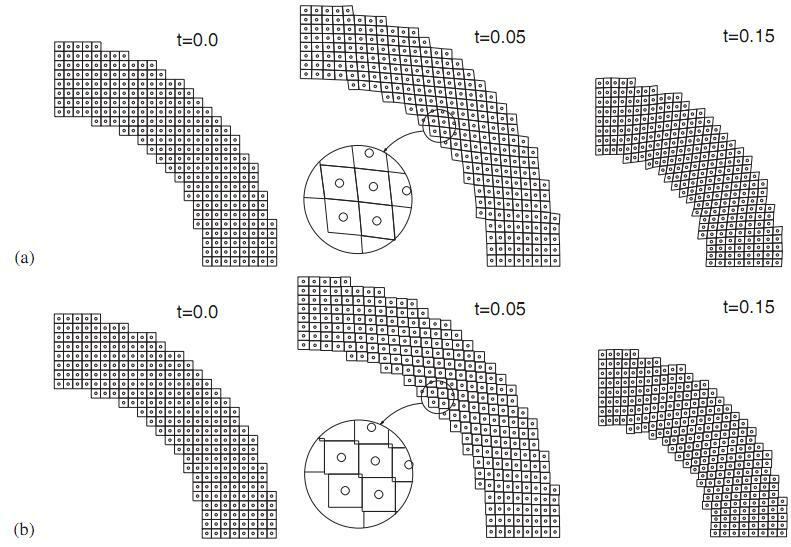 A new algorithm is developed to improve the accuracy and efﬁciency of the material point method for problems involving extremely large tensile deformations and rotations. In the proposed procedure, particle domains are convected with the material motion more accurately than in the generalized interpolation material point method. This feature is crucial to eliminate instability in extension, which is a common shortcoming of most particle methods. Also, a novel alternative set of grid basis functions is proposed for efﬁciently calculating nodal force and consistent mass integrals on the grid. Speciﬁcally, by taking advantage of initially parallelogram-shaped particle domains, and treating the deformation gradient as constant over the particle domain, the convected particle domain is a reshaped parallelogram in the deformed conﬁguration. Accordingly, an alternative grid basis function over the particle domain is constructed by a standard 4-node ﬁnite element interpolation on the parallelogram. Effectiveness of the proposed modiﬁcations is demonstrated using several large deformation solid mechanics problems. This entry was posted in Abstracts, Projects, Publications, Research, Verification and tagged accuracy, CPDI, deformation, gradient, large deformation, material, mechanics, motion, rotation, simulation. Bookmark the permalink.